This was so much sluggish and there was no corner cutting at all when I bought it. At one point I thought this was waste of money. But after swapping shengshou 5x5 springs and lubing and tensioning this cube, it became SUPER FANTASTIC. I started loving the feel and control of this cube. Moyu should improve their 6x6 quality and they should not make the spring change a must. Overall ,it is a fantastic cube. This is probably the best 6x6 out there! It feels nice in your hands, and it looks nice as well. Shades are normal MoYu shades (which I love). The only real problem I had with the cube was the popping. It happens about once every five or so solves if you are not careful. It MAY be my tensions, but I don't want to make it tighter than it already is. The pieces that normally pop are the pieces in the second layer. Overall, it is a very great cube! I would definitely recommend it. It's a great 6x6 but a big issue that I consistently have to deal with is the pops that are mostly caused by lock ups. 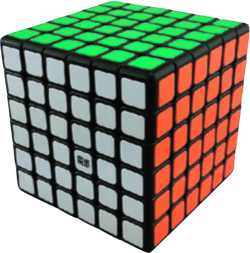 out of the box, the shengshou 6x6 was slugish , locked a lot, and had occasional pops. And lube (lubicle speedy) did help, but not much. This is a very good cube. It's very fast for a 6x6, and is relatively stable for one (it does have some lockups and it feels slightly flimsy). I personally find it hard to tension, but that might not be the case for everyone. Overall, I would definitely recommend this cube.